The challenge was to satisfy the impedance matching requirement when the antenna, resonator, and matching components are loaded with the nonlinear diodes. Ericsson’s goal was wireless power transfer of a couple of hundred nanowatts at 1 V to power a sensor node. The transmitted power was at 24 MHz. Keysight’s ADS Harmonic Balance simulator was used to explore the design space around the innovative impedance transformation using a high Q quartz crystal resonator. The resonator could transform the weak harvested signals from the low impedance antenna to a voltage able to forward bias the Schottky diode junction. Government regulations generally limit the transmitted power so a typical harvesting antenna only receives at most –30 dBm (1 μW). Prior solutions in this design space had only achieved about 10% total efficiency. To power the sensors Ericsson required for their design, they needed a conversion efficiency > 20%. To existing designs, Ericsson added a high Q quartz crystal resonator to introduce an impedance transformation between the antenna and the rectifier. The challenge was to satisfy the impedance matching requirement when the antenna, resonator, and matching components are loaded with the nonlinear diodes. Knowing the ADS Harmonic Balance simulator is accurate for RF/microwave circuits, and that this power electronic circuit has much in common with RF/microwave circuits, Ericsson set up a simulation to predict the performance and explore the design space. Unlike SPICE simulators, which typically only handle linear circuits in the frequency domain (“AC analysis”), ADS Harmonic Balance handled the tricky nonlinear effects Ericsson needed to model in order to achieve optimal performance. Ericsson could quickly explore the design space with a set of trustworthy simulations before committing to fabrication. Once the design was optimized in the simulator, they invested in building the prototype. Ericsson achieved excellent correlation with the measurement, and the circuit delivered the required efficiency. The conversion efficiency improved from less than 10 to 22.6%. As shown in figure 2, the simulation correctly predicted that the peaks of the family of curves of efficiency versus frequency would shift. The nonlinearity of the diodes caused the peak to shift about 200 Hz as the input power increased from –50 to –20 dBm. This subtle effect was seen in both simulation and measurement. 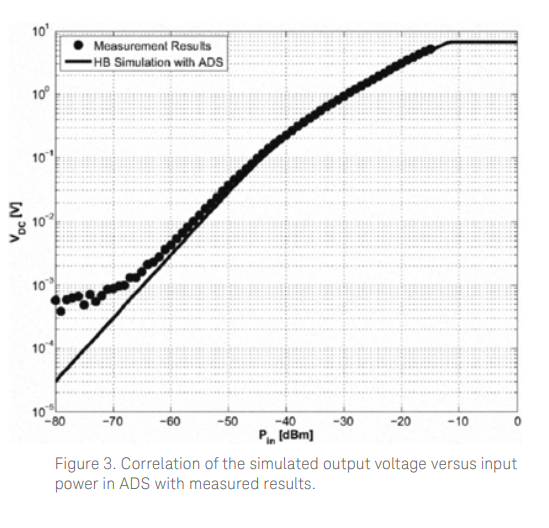 Figure 3 shows the simulation-measurement correlation of the output voltage versus input power. 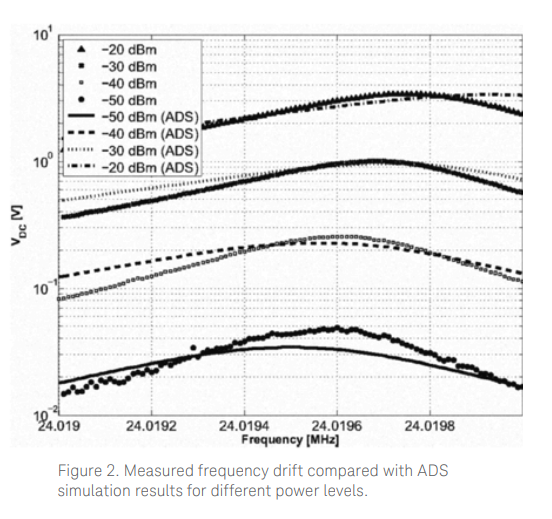 Read the paper, “RF Energy Harvesting Design Using High Q Resonators” to learn more details about how Ericsson and Frieburg University designed a high Q power harvesting circuit using Keysight ADS. Learn how ADS can help you in your power harvesting designs by clicking here for a free trial.